In the nearly five years it took Def Leppard to record their landmark 1987 album, Hysteria, the Sheffield hair-rockers disposed of two producers before reuniting with Robert "Mutt" Lange, drummer Rick Allen lost his arm in a horrific car wreck, and lead singer Joe Elliott came down with a gnarly case of the mumps. But now, as the band prepares to play their most famous album in its entirety for a nine-show residency entitled Viva Hysteria! at the Joint at Las Vegas' Hard Rock Hotel, Elliott tells Rolling Stone that he sees the album's notoriously embattled sessions as nothing short of inevitable. "You'll find that most albums that are considered classic records were born out of an enormous amount of pain," he says. (Hysteria has sold upwards of ten million copies to date.) "There were no deals with the devil or curses. It was just a really long process." 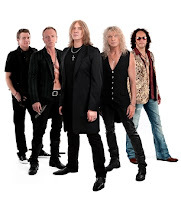 For the forthcoming Vegas engagement, which kicks off on March 22nd, the Leps (including bassist Rick Savage and guitarists Phil Collen and Vivian Campbell) will play their iconic, big-balled LP every night in its entirety during the show’s second set. But it’s the first set that Elliott believes will prove to be the most exciting: The band will perform a slew of rarities and lost gems, he says. The singer is mum on which songs in particular will be revisited, but he reveals that anything pre-1983's Pyromania is fair game. "That's about as much information you're going to get out of me without waterboarding me," he says, with a menacing chuckle. The challenge of playing Hysteria front-to-back, the singer adds, is not so much in the songs themselves. After all, Def Leppard has been playing many of them, including "Pour Some Sugar On Me," "Animal," "Love Bites," and "Armageddon It," "nearly every night for 20 years," as Elliott explains. It's the oddity of playing songs like "Sugar" – usually reserved for the encore – much earlier in the set that will prove bizarre. "It's going to be a bit of a head trip. But I think that's OK. It's gonna be weird but people are going to be expecting it." As for the lesser-known Hysteria cuts, including "Run Riot" and "Don't Shoot Shotgun," Elliott confesses that he hasn't sung them in approximately 20 years. Still, he’s hardly worried. "It'll not be too hard," he says, confidently. "We're not changing arrangements – like [David] Bowie or Tom Waits might do. We are going to play these songs as they are on the record" – something the band hasn't done as of late. "This way we're going to revert back to the original versions." The Vegas run should also offer an added bonus for Def Leppard: Elliott says he's hopeful that the extended engagement will give the band ample time to record new material. The singer says both the relaxed performing schedule (the band will have three days on and four off), as well as the fact that Vegas will mark the first time in ages all five members will be in the same location for several weeks’ time, should prove beneficial to the creative process. Elliott envisions the band converting an extra hotel room into a mini-studio of sorts. "Hopefully they won't kick us out," he says. As for whether the band will deliver what would be their first full-length album of new material since 2008's Songs from the Sparkle Lounge, the verdict is still out. "I don't know if we'll do an album," Elliott says. "Maybe the way to go is put one or two tracks out at a time and see how it goes. Almost like a 7-inch single." "We've got a golden opportunity," he continues. "We've got ample opportunity to look each other in the eye and go 'what you got?' We're back to that rehearsal-room vibe."